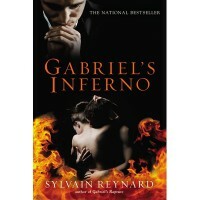 When I saw that Gabriel's Inferno was available through KLB Blog tours I was so excited! It's a book that had been on my wishlist for a long time. I knew that one of my favorite book pimps, Bells from Hanging with Bells loved this book and on Goodreads it only had one two star review-so I thought that I would love this book just as much as everyone else did. Sadly though, this book was a did not finish for me. The main reason I wasn't able to finish the book was because I had a hard time connecting with the hero and heroine. I just couldn't connect with them at all and I'm still not sure why. I think my main problem with Julia, the heroine was that it took her a long time to have a spine when she was around Gabriel, and by the time that happened it was too late for me. With Gabriel my problem was that he was such a jerk to her. I know he was supposed to be all thing evil, and generally I like my heroes a bit on the jerkish side (I have book boyfriend issues) but I think because Julia was so timid that the jerkiness just didn't feel right too me. Not connecting with either of these two led to me having a hard time buying into the relationship they had~ which at 50% into the book the actual romance between them hadn't happened yet. What did happen was a series of miscommunications and both sides fighting the attraction they both had to one another. The miscommunications were all well and good, but the triangle that formed didn't grab me at all either. Poor Paul, a PH.d student who also falls for Julia bothered me more then Julia did. It bothered me that he called her Rabbit as a nickname and that she let him do it. It also bothered me that he was constantly standing up for her whenever Gabriel would be mean to her in class, when all I wanted was for her to do it instead. By the time Julia finally does stand up to Gabriel I wanted to cheer for her, but found myself wondering what took her so long to do it. The book wasn't all bad~I found myself really enjoying learning more about Dante and the city of Toronto. The writing was actually really good, and it was what kept me reading for as long as I did. The author did a really good job of painting Gabriel to be Dante and Julia to be the picture of innocence. I think that fans of contemporary romance will enjoy this story~the characters are different and intriguing, they just weren't for me. Thanks so much to KLB Virtual Events for letting me be apart of this tour!